Welcome to the Behind the Bar blog. My name is Sean White and I’m the landlord of The Queen’s Head in Pinner’s historic High Street. Along with my team I share the goings on at our busy pub which has sat proudly at the centre of the community since 1540. What started off as just a usual Sunday morning preparing for a busy afternoon took a horrific turn last weekend. I was told about the murder of shopkeeper Ravi Katharkamar by one of our regulars who explained that the incident on Marsh Road was the reason the police had sealed off the road. My initial reaction was absolute disbelief then deep sympathy for Mr Kathakarmar’s family. Here was a hardworking man, simply going about running his business. To be killed first thing in the morning for loose change in such a barbaric way is a truly awful, mindless waste of life. The reaction among people in the pub was a stunned one. Mr Kathakarmar’s murder has shook the village to the core. I cannot recall anything similar in my decades of living here. As a local business owner, it has made me far more security conscious. And I know that is a feeling shared among other traders in the village. I hope the police catch the offenders quickly and take them off the streets for a long time. London has been plagued with lethal knife crime for several years now, but I never thought it would come to Pinner in such a devasting and heart-breaking way. Something must be done to cure this disease on our streets. Our thoughts and prayers are with Mr Kathakarmar’s family and loved ones. The only good that can come out of such a terrible thing would be for the community to unite and honour the memory of Mr Kathakarmar. Welcome to the Behind the Bar blog. My name is Sean White and I’m the landlord of The Queen’s Head in Pinner’s historic High Street. Along with my team I share the goings on at our busy pub which has sat proudly at the centre of the community since 1540. My apologies for the recent gap in my blogs. One of the things I really love about running a pub is you get to see people enjoying themselves. Food, drink and good company – it’s a recipe for a great time when money, health, financial and other worries are suspended for a while. The Queen’s Head is a love factory. There it is. I said it and I’ll stick to it and explain why. With so much anger, anxiety and hate in the world right now it’s worth thinking about the things we love. I’m blessed that I have a loving family, a job I adore and close friends. I also feel very lucky to have a team of staff who are great to work with and feel like an extension of my family. It’s always my goal to make sure that my staff are looked after well. That’s why I pay way above the minimum wage, invest in their training, going out for team dinners and making sure they all get free taxis home when they finish a night shift. We’ve also introduced a great project called PerkBox which is a website for hospitality workers packed with discounts and freebies. The staff love it. It seems only right to continue this love theme by telling you about what we have planned for Valentine’s Day. If that isn’t enough to get your heart racing then I don’t know what will. So till next time keep loving, laughing and enjoying life. Thanks for reading and pop in and see us soon. Welcome to the Behind the Bar blog. My name is Sean White and I’m the landlord of The Queen’s Head in Pinner’s historic High Street. Along with my team I’ll be sharing the goings on at our busy pub which has sat proudly at the centre of the community since 1540. It’s that time of year when you don’t really have time to read blogs, so I’ll keep it short. Writing this gives me sufficient time to reflect on what a wonderful job, being a publican in this great community pub really is. Every day, I get a chance to see people from a diverse set of cultures, and an equally diverse range of professions and occupations, young and old, able and infirm, and all meeting and talking together. What an absolute joy. Sadly the Queen’s Head is not the microcosm of society we might all wish for, but it’s a good start. Christmas prompts all us to think about a fairer and more equal world, and one where child poverty can be eradicated. Hopefully In the New Year we will see multinational companies like Google, Facebook and Amazon sharing that view about fairness and equality, and deciding that the ‘right thing to do’ is to pay the same percentage of tax and national insurance as their UK employees. Thank you all for another great year, and one in which we won an amazing accolade as Greene King Pub of the Year out of 1200 UK pubs. I wish you and your family a very happy Christmas. I’ve been doing a lot of thinking lately about the importance of Public Houses and the role they play in our communities and societies. It sounds like the thesis for an academic study but it’s a subject I’ve always taken seriously. The key to unlock the potential of a Public House is to make it a place for the public to come together, hence why they are called Public Houses. I think it’s a misconception to see pubs purely as places people drink alcohol. They play a much bigger role than that and good Public Houses offer much more than that. At the Queen’s Head we provide a place for people to congregate and communicate. This has been brought to the forefront by us adopting the Chatty Tables scheme. It’s an initiative where people can come to the pub and sit at a designated table which makes it clear they are up for having a chat. We live in an era of increasing social isolation and this kind of project is doing something to combat that. We are also now open for breakfast and I’m already seeing a lot more people coming into us for their morning coffee and then to work in the pub, using our wi-fi and benefitting from being surrounded by other people. It’s great to see. And if that wasn’t enough to shatter the misconception, we’re now noticing a big surge in the amount of non-alcoholic drinks we are serving. From the delicious Seedlip (Alcohol free G&T served with Fevertree tonic) to zero percent alcohol beers and ciders. To adopt the strapline from a famous chocolate bar I see a great Public House as one that offers opportunities to work, rest and play, whether you’re enjoying a lager, latte or a lemonade. Welcome to the Behind the Bar blog. 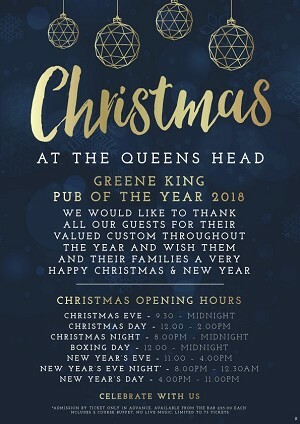 My name is Sean White and I’m the landlord of The Queen’s Head in Pinner’s historic High Street, voted Greene King UK Pub of the Year 2018. I’ve recently come back from a short trip to Majorca to catch some autumn sun. Seems like it was just as sunny in Pinner. I love Spain, especially the eating out experience, but the levels of customer service can vary from wonderfully attentive, warm and welcoming (a treat) to impersonal, cold and very slow (a trick). One of the things I’ve been obsessed about at The Queen’s Head is that all our guests get a warm welcome and that they feel we appreciate and value their patronage, which we do. I’ve always wanted to do things differently since taking over the pub and this Halloween is no different – because we’re going spookily big and will be hosting Halloweek. A series of events that will include the showing of The Rocky Horror Picture Show on our outdoor screen on the patio on Tuesday 30 October. Check our website and social media for times. Then the following day will be hosting a Halloween party in the evening. There will be a contest for the best dressed guy or ghoul, so why not join in the fun, get the make up out, your best scary costume on and join us for a night of thrills and frightfully good fun. £50 cash for the winner. £30 large pizza voucher for runner up. And a bottle of wine for third place. We look forward to seeing you for what will be a great couple of evenings at your local community pub. Trust me, it’ll be a scream. On Thursday 6th September we received the best news I’ve ever had while running The Queen’s Head. At a posh gala evening at the Royal Lancaster Hotel in London we took our place among four other finalists in the Green King Pub of the Year 2018 awards. We were delighted to simply have made the shortlist and looking at our competition it was obvious we up against the elite of the pub industry. More than 1200 pubs had entered. I’m over the moon, especially because the judges listed why we had won. They remarked on our innovation, emphasis on staff training and the success we’ve had in increasing the pub’s turnover during the past five years when many other pubs have struggled. I’d just like to take this chance to say a huge thank you to our team, our suppliers and of course to our lovely customers. Watch this space for a special celebration we’ll be holding to mark this massive achievement for us. I’ve always seen pubs as much more than places which sell alcohol. For me they are community assets – but only when they are run correctly and have a clear ethos of inclusivity. In this world where people are increasingly being polarised and disconnected from each other, a good pub brings people together to debate, discuss and I’ve seen on countless times how they can be places where barriers are torn down and new opinions formed. The Queen’s Head is a pub which welcomes everyone regardless of race, religion, gender or sexuality. And that’s why I’m so proud to be announcing our first Pinner Pride festival which takes place on Sunday 23 September. It will be a celebration of love, diversity and community. It’s a family event for all the people of Pinner and beyond. And there will be something there for everyone to enjoy. We’ll have Live Music, a DJ, food stalls, books from Brooks, outdoor bars, a gin garden, face painting, children's rides and much, much more. Tickets are £5 each and available at the bar. But be quick as we have a maximum number of tickets we can sell, and they are already proving popular. The event runs from 2.00 - 9.00pm and is being generously sponsored by Rawlinson Gold Estate Agents. Here’s a final thought. A good pub is like a great film. It suspends reality for a period while you’re there. Whilst we are talking about film, our Secret Cinema pens on Tuesday 18th September at 7.30pm showing Mama Mia. Admission free, first come, first served. Bring your own blanket. So, forget that idiot Trump, banish Brexit blues and come along to Pinner Pride which promises to be an event to remember and one I’m immensely proud of my team for putting together. When I took over The Queen’s Head my goal was always to make it the best pub in the borough of Harrow. My team and I have all worked tirelessly over the years to make our pub a place where people can come together to share good times in a safe, modern, friendly and totally inclusive environment. So, you can imagine my absolute delight when we recently saw off 53 other public houses and bars to be awarded the Best Independent pub in Harrow by the Best Bar None organisation who worked in partnership with Harrow Council. 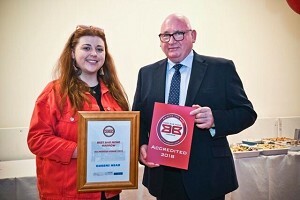 Best Bar None is an Accreditation Scheme with National Awards supported by the Home Office and the drinks industry which is aimed primarily at promoting responsible management and operation of alcohol licensed premises. It was piloted in Manchester in 2003 and found to improve standards in the Evening and Night Time Economy, with premises now competing to participate. This is an award to all the team at The Queen’s Head. I’m so proud of these young people who work hard, have fun and make sure our guests are well looked after. I need to make a special thank you to Kirsty MacPhee. Kirsty, our General Manager is an absolute gem and a key part of our team. She put in all the hard work to enter us for this award and I am chuffed that her efforts and that of all her colleagues has been recognised. We received the award at the Masonic Hall in Kenton at an event 10 days ago which all the team attended. We had a great celebration after the event as you can imagine. I’d also like to thank our guests from the regulars to the occasional pop in for a pint (or a coffee, we serve great coffee – watch out for more of that in our next blog). As pubs shut down in their droves across the country we never take for granted the custom we receive and it’s that which drives us on to keep striving to offer the best possible experience in Harrow – which we can now proudly say we officially do. Tonnes of chocolates, loads of bunnies, piles of hot cross buns and hopefully plenty of family get-togethers. That’s right folks the long Easter weekend is nigh upon us. A time for enjoying family traditions. And in many cases probably putting on a few pounds over the long weekend. Some Easter traditions around Europe raised an eyebrow or two in the Queen’s Head this week. In parts of the Czech Republic and Slovakia there’s an Easter Monday morning ritual of men lightly whipping women! Apparently, it’s so the women keep their health, beauty and fertility for the next year.However, the women get revenge later in the afternoon by pouring buckets of freezing cold water over the men’s heads. Sounds fair to me. Closer to home it’s also traditionally a busy weekend for the pub. We’ll be open until midnight on Good Friday and Easter Saturday. Easter Sunday open till 11.00pm and the Monday night quiz will be happening as usual. This Easter will also mark the opening of our outside bar, so you can have a drink al fresco on Friday and Saturday evenings. The bar is fully stocked and was always on my to do list when I took over the pub. It’ll be open until October and we’ll still be offering the delicious Barrel & Stone pizzas and piadines to guests wherever your relaxing, inside or outside the pub. Another welcome addition to the Queen’s Head’s offering to our guests will be the premium Japanese beer Asahi. The Japanese don’t produce low quality things and this beer will be among the highest quality of those we sell. Here’s to wishing you all a Happy Easter and we would love to welcome you and your families this weekend. Thank you for your continued support and thanks for reading. So, it’s one of my favourite days of the year this Saturday 17th March. St Patrick’s Day. As I’ve said before it’s a day when everyone becomes Irish regardless of where you are from. I say everyone, but English rugby fans can be excused for begging to differ as they play the boys in green on Saturday. We’ll be celebrating in traditional Irish fashion with live music from Jason Hakin and above all the most important recipe in any St Pat’s celebrations -good company and good humour. But far from being just a marketing tool for global Irishness and the hospitality trade the legend of St Patrick is a fascinating one. The dates of his life can’t be fixed with certainty, but there is broad agreement that he was active as a missionary in Ireland during the second half of the 5th century. He’s regarded as the founder of Christianity in Ireland. When he was about 16, he was captured by Irish pirates (who knew there was such a thing) from his home in Britain and taken as a slave to Ireland to look after animals. He lived there for six years before escaping and returning to his family. After becoming a cleric, he returned to northern and western Ireland. In later life, he served as a bishop, but little is known about the places where he worked. By the seventh century, he had already come to be revered as the patron saint of Ireland. St Patrick is often credited with driving out all the snakes from Ireland. Quite a feat because the consensus of scientists believes there were none on the Emerald Isle to begin with. But hey let’s not spoil a good story. Saint Patrick's Day is the supposed date of his death. So, come on down to the Queen’s Head this weekend and raise a glass in memory of St Pat and in celebration of people of all different backgrounds coming together to share a drink and enjoy the craic!